Appears to be a good price. Good unit - I bought the black version about 18 months ago. Very stable, even with power adapter plugs plugged in. Can't vouch for the effectiveness of the surge protection though, as thankfully it's not (yet?) been called into use. 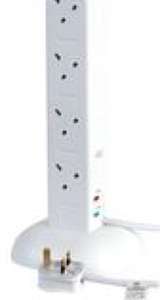 I'm more into having enough wall sockets and the right length flex - but, if you use (multi-way) extension leads - this looks pretty much a bargain for a 10 way, even before whatever surge protection it might actually provide in addition. Thanks, OP for posting it. More suited to things that you leave plugged in. If you want to be constantly plugging and unplugging - I'd suggest paying more for a big name one. Please remember that extension leads should only be plugged directly into wall sockets. Never into adapters or other extension leads. Not even good quality ones, let alone "unbranded" ones. Can you take the stand off guys?? Not on the I got for my mother was an energiser one from B&M. Personally don’t thing so but could be wrong. Ordered this a week ago very good for the price and took 3 days to come. Thanks OP - just bought.